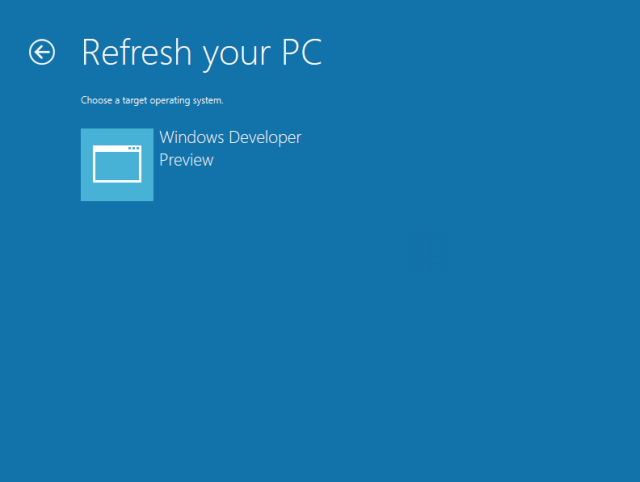 I have decided to be a news fanboy and start writing articles about new features implemented in the upcoming Windows 8. Pretty much everyone is doing it, so you may see a bit of regurgitated tech lingo here and there, although I will try to be both funny and original, while maintaining utter professionalism and keeping you informed. What more, I am sort of a Linux guy, which makes the me the best person to give you an objective report on the state of the new Windows. 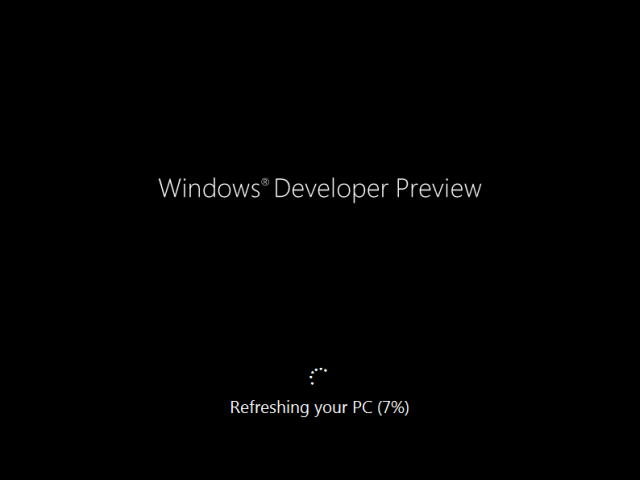 Seriously, there are lots of interesting things coming in Windows 8 that we should talk about. Some are definitely overplayed, like the security, most of which you have already seen in my Windows 7 articles, one and two, but we might have another sequel. Then, there's the supposedly improved boot process, but that's for later. A new filesystem? Yes, please. Personalization, safe mode? Sure, we will discuss those, too. Today, we will focus on the new refresh/reset feature. The choice of words might be a bit tricky, but essentially, Microsoft want to make life easier for average users by giving them an option that OEM have been doing for years with Windows-based laptops - an ability to reset the system to factory settings, so to speak. More advanced users will probably not be using the built-in system recovery mechanisms, as imaging sounds like a more flexible, more useful option. But then, even they might get lazy and choose the new stuff. 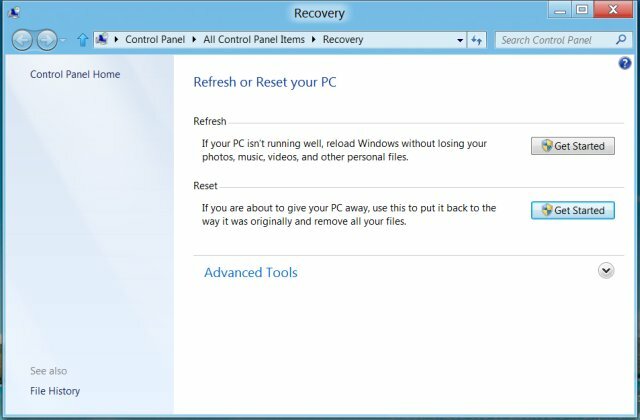 The two functions are available under Recovery in the Control Panel, using either the new interface or the old interface. However, you can only run them from within Windows if you have the Metro interface enabled, so please be aware of that. Now, this is nothing sinister, because you can toggle Metro on and off with a single registry key change and one login, no reboot required. 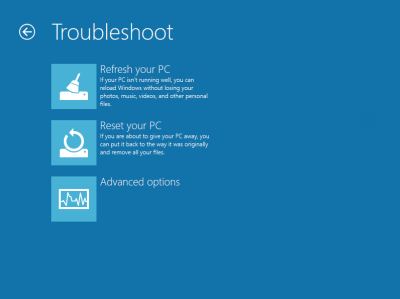 Alternatively, you will need to fire up the recovery console during the boot and invoke the necessary functionality. You can also pop in the installation DVD and repair your system. The options are many and varied. 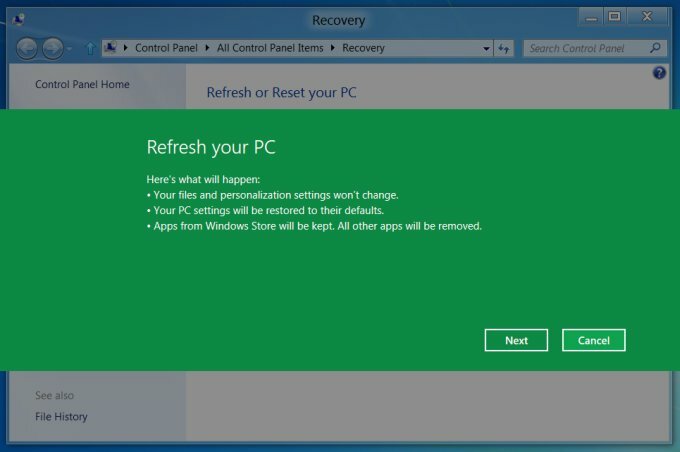 Refresh is similar to booting into safe mode and trying to repair your Windows, using the sfc command on Windows XP, inserting your CD and then letting Windows fix corrupted system files by copying from the disc, or by using the recovery console in Windows 7, which then accesses the 100MB hidden partition where core system files are saved for emergency. Refresh is all of these combined. It will let you reload core system files from its backup. Personal data will not be touched, although there is no guarantee that the repair process will work. So you are advised to keep your stuff on a separate partition and have a sound backup procedure in place. Imaging your system is also a wise choice, especially since you have a plenty of useful tools available, all for free. Lots of links on imaging further below. You will lose programs installed manually. All your settings and tweaks will also be restored to default. So please think twice before you permanently refresh your system. Reset is a more stringent operation. It is designed to truly reset your system to factory defaults, which, in this case, might be either a preinstalled setup or your own manual installation. Either way, you will lose all of your data and the system will go back to its pristine, fresh state. This kind of operation might be desirable if you plan on giving away your machine with Windows installed, but you fear there might be traces and leftovers of personal data stored somewhere. Now, technically speaking, your data will still be there on the disk, only not accessible by the regular means of browsing using the Windows Explorer. So if you are keen on privacy, then you might want to consider a low-level format. We will have a separate discussion on this one soon. What to choose? And when? Now, the tough decision. 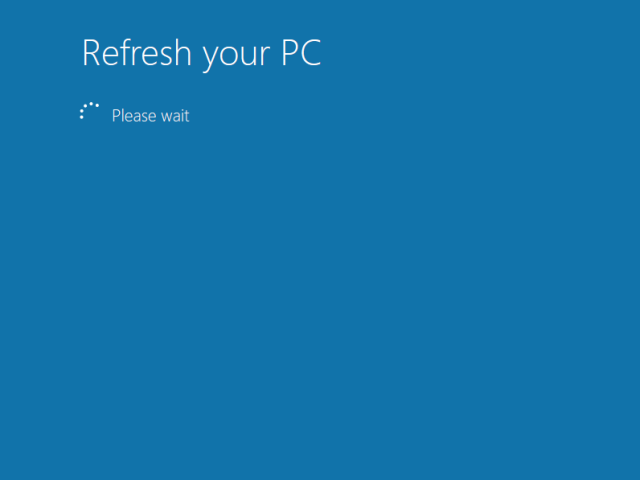 Normally, if you are practicing safe and sane computing and do not abuse your system, you will probably never need to execute the Refresh option. In fact, you won't need ever fight BSOD, boot into safe mode, use the recovery console one way or another, or even invoke the system restore. All this assuming you behave. If bad things happen, restoring your machine to a state that might have existed two years back or so could be painful. And the time you will need to get all your programs back might be equal to starting fresh and reinstalling from scratch. So you might be better of with system imaging, executed periodically before big changes. The Reset sounds more useful, because it is more final. This is the kind of thing you will do when you no longer expect to continue running your system, so there should be fewer doubts about what might happen. Just remember that physical data might remain stored on the disk. Does this really work? Well, let's see. In my case, I deliberately borked a virtual machine, messing up the display by using incompatible 3D features in VirtualBox, which caused my test image to stop being usable. Then, I loaded the recovery console and started playing. You will notice the new style and colors used. In all previous versions, Windows used a more classic recovery console. Here, it's inline with the new theme. The two dominant options are Refresh and Reset, but you can also do all the other things. Since our system is no longer functioning, but we still supposedly need our data, we will try refreshing the host. This means we ought to go back to default system settings, with our personal stuff still intact. Windows Store apps will be kept, which is a nice thing. Your next step is to choose the target, if you have more than one instance of the Windows operating system capable of being refreshed installed on your disk. In most cases, for the vast majority of users, there will be only on target, Windows 8 or higher. 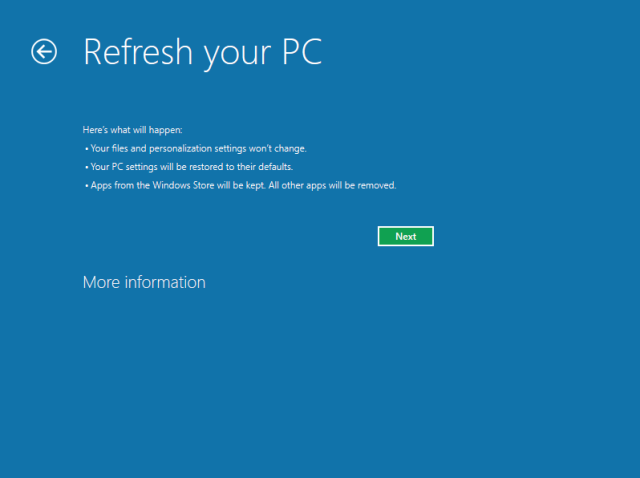 Next, Windows 8 will prepare itself for the purging process. Do note the somewhat confusing message about being plugged in. This refers to the power source, if you're running on a laptop. In general, whenever you're doing any system maintenance on any operating system, you should not work on the battery power. And then, the actual refresh will begin. This can take a while. After the Refresh process was complete, the system came up just fine. Indeed, it was restored to its original state, with all and any trace of my shenanigans gone. The feature seems to be robust and it's quite easy to use. There you go. own blog post with much simpler steps using mostly GUI based tools. The steps I am outlining below can be used to create a Windows 7, Windows 8, Windows Server 2008 R2 or Windows Server 2012 VHD. either mount an ISO image or have the DVD or thumb drive with the Windows 8 installation media on it. I happen to use a freeware tool called Magic ISO CD/DVD Manager to mount ISO images. Before I provide the detailed steps, let me just provide an overview of the process. First, I need to be running Windows 7 or higher or Windows Server 2008 R2 or higher in order to perform these steps and have administrative access. I then need to create a VHD file and format it. Mount the ISO of Windows 8 (or have the thumb drive or DVD inserted or just have the source files available). Use ImageX to install Windows 8 into the VHD. 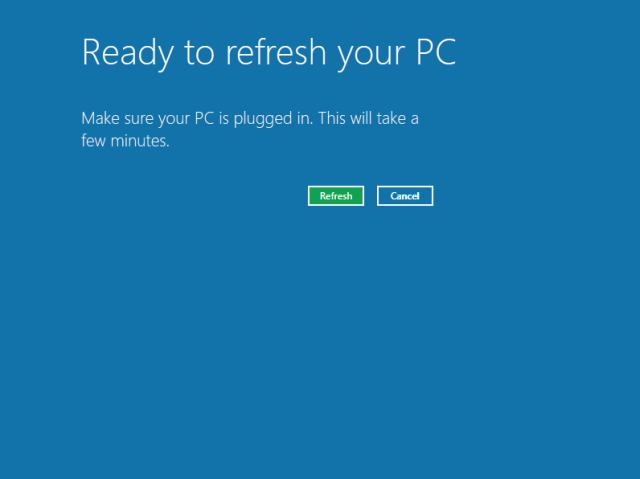 Add the installation of Windows 8 to the boot menu. Now, for the details behind the above 6 steps. I will be providing screen shots of this process from a Windows 7 machine. A. To create and mount the VHD, I will use the Computer Management console to access Disk Management. 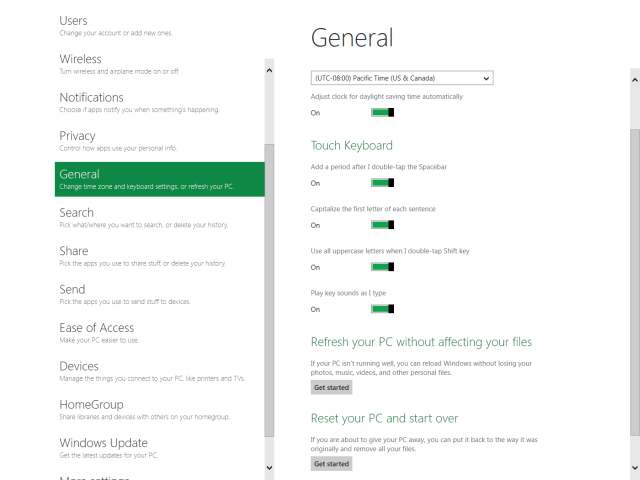 I can start this by running it from the Administrative Tools Group or right click on Computer and choose Manage. B. Once Computer Management console opens, I will click on Disk Management on left pane and wait for the list of drives to refresh. Once the list of drives appear in the middle pane, I will right click Disk Management and select Create VHD. that meets your needs, but keep in mind that the size of the partition you set is important as you will need that much actual free disk space in order to boot to that VHD. Also the type determines how much disk space will always be in use. Since I use laptops for most of my work and I dont have 1 TB laptop drives, I try to keep the size of all my VHDs that I use for multi-boot purposes to a minimal size. I find that 20 GB partitions is plenty and that dynamically expanding work just fine for my purposes. D. Once I click OK, the new VHD file is created and automatically mounted and visible in Disk Management. From there I right click Disk 2 and select Initialize to Initialize the disk as MBR. After the disk is initialized, I create and format a simple volume. E. After the disk has been formatted, Windows 7 automatically assigns a drive letter to the volume (in my example, it is F . I have also mounted the ISO of Windows 8 Enterprise 90 Day Eval and it is available as drive E: in my example. F. I then start a command prompt running as Administrator and go to the directory in which my ImageX.exe is located (makes it simple and in my case it is C:\Source). H. Once the process completes, I can dismount the VHD and save a copy off for future use or immediately add it to the boot menu. To dismount the VHD, go to Disk Management and right click Disk 2 and select Detach VHD. I. Once I make a backup copy of the VHD file for future use, I will go ahead and Mount the VHD again to add that installation to the boot menu. To do this, I will right click Disk Management and select Attach VHD. The Attach VHD Wizard will start. I can either browse to the VHD or just type it in the Location field. J. The VHD will be mounted and will be assigned a drive letter by the system. In my case, it is drive F: again. 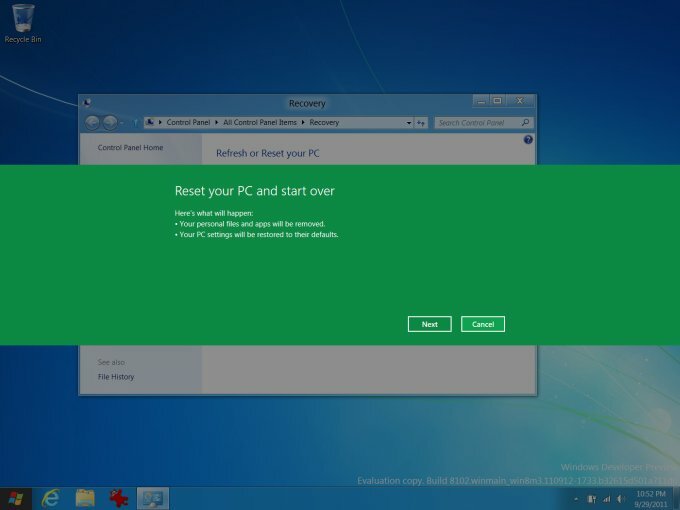 L. Once the command finishes, you will now have the new Windows 8 entry in your boot menu. The first time you boot to this installation, Windows 8 will detect your devices and install the appropriate drives and then reboot. 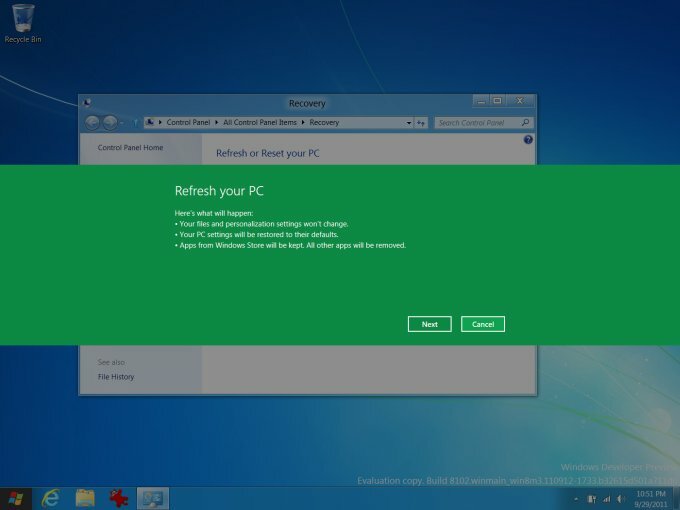 Upon reboot, you will configure the computer name and a user account like you normally would on a new Windows 8 installation. If you no longer want to have this option in your boot menu, use MSCONFIG (boot tab) to delete the unwanted entry. Hopefully, this simple and easy to follow guide will help you to successfully create and boot to your own installations of Windows 8 (or Windows Server 2012). Mkuu hakuna namna ungeweza kusummarize,mbona nikisoma post ya pili ikiisha nakuwa nimeishasahau post ya kwanza ulisema nini? Vipi sasa kaka Mrimi Poa?